Generally speaking, humans walk with their two feet pointed straight ahead. Makes sense, right? But skewed feet can happen and for different reasons. Bone shape and conditions at the knee and hip are factors, but the most common reason for skewed feet is muscle weakness somewhere in the lower body. This weakness could be caused by cultural influence, like wearing overly tight or heeled shoes, sitting too much, or from overusing specific muscles in sports or dance. To keep you moving forward, the body compensates for weakness by employing a new motor pattern that involves foot skew. However, continuing to walk with this new pattern and never addressing the primary weakness will mean more wear and tear on your joints over the long-term. To help avoid degenerative and painful diseases like arthritis of the feet, knees, hips, and even lower back, it’s helpful to keep your lower leg and feet strong, nimble, and working as designed. While walking, do your feet turn out or in more than most other people? Is one foot skewed more than the other? Where do your feet point while standing in your regular stance? Is one foot very different from the other? Without shoes or socks, position your feet so the outside of your feet are forming parallel lines. Observe in a mirror any differences between your right and left. Is one arch more developed? Is one ankle diving in or out more than the other? Do you have a bunion or hammer toes? Is it hard to move all your toes and do the other exercises from this earlier post without letting your ankle bones roll in or out? Do you usually have injuries on the same side of the body? If you answered yes to any of these questions, you might have weaknesses somewhere in the body that could eventually lead to painful joints and degenerative illnesses. For some, just having awareness of your feet and practicing a straighter foot placement might be all that’s needed. 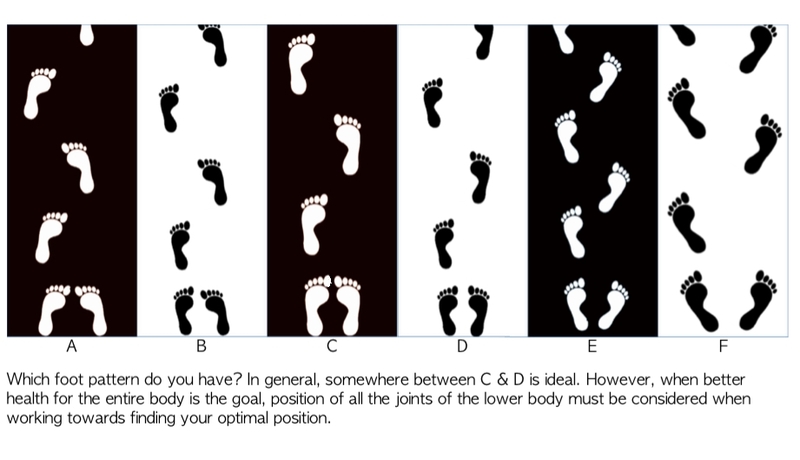 For others, especially those who are already in pain, a systematic assessment and well-trained eye is needed to uncover YOUR optimal walking alignment. Seeking out the help of an Restorative Exercise Specialist now can lead to a better quality of life for your many years ahead!